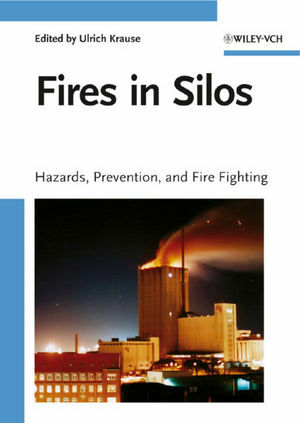 Providing many lessons learned from past silo fires coupled with in-depth knowledge from experts, this book explains current prevention measures in detail -- helping to prevent future damage. It covers numerous types of fire detection devices and fire fighting equipment, backed by extensive data tables listing fire and explosion characteristics of bulk materials, color photographs of silos on fire and documentation of firefighters' actions. In addition, diagrams and formulas as well as pre-prepared check lists are included for risk assessment and fire fighting actions. Possibly lifesaving reading for chemists in industry, engineers, chemical engineers, health officers, environmental consultants, instructors in the chemical industry, as well as chemicals suppliers and safety officers. Dr. habil. Ulrich Krause is head of the division "Fire Engineering" at the German Federal Institute for Materials Research and Testing (BAM) in Berlin, Germany, which he joined in 1991. He studied fluid mechanics and thermodynamics at the Technical University of Dresden from 1980 to 1985 and obtained his Ph.D. in 1989. In 2001, he completed his Habilitation(equivalent to D.Sc.) on heat and mass transfer in dust explosions, also at the Technical University of Dresden. His research interests focus on accidental fires in bulk materials, solid fuels, dust explosions, and on the CFD modelling of fires and explosions. He lectures on computational methods in process safety at the Technical University of Berlin. He is member of several EU standardization working groups, has authored and co-authored three monographs, and has published over 50 papers in scientific and technical journals to date.